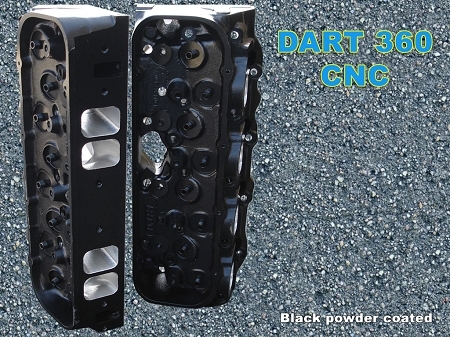 Dart 370 CNC Race Series Big Block Chevy Cylinder Heads. These are Brand New Dart CNC 370 heads that have been black chromate coated for corrossion resistance. These are perfect for a marine environment. They are being sold bare and the price you see is a for a set of heads. Dart big block heads deliver superior performance without the hassles of welding and modifying stock castings. 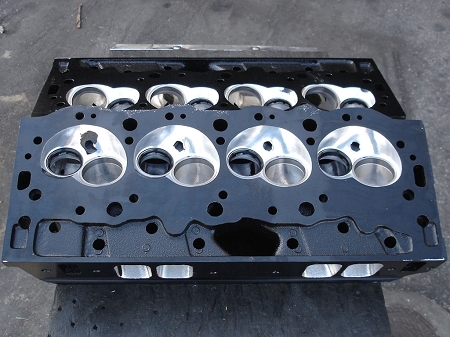 We applied proven Pro Stock technology to produce big block heads that out perform the competition - yet Dart heads can be used with most off the shelf pistons, manifolds, headers and valve train components. Water passages between exhaust ports improve cooling and prevent "hot spots" that can cause head gasket failure. Gasketed 3/4" reach spark plugs offer widest selection of heat ranges. Exhaust Bolts: 1” longer than stock (4) ea. Milling: Min. 105cc / .070” (.005” = 1cc) Flat mill only.